We’re back! Again! 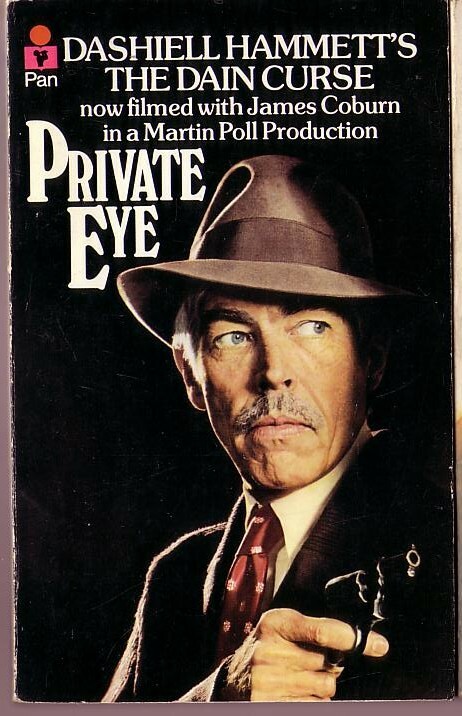 Let’s continue exactly where we left off in “The Dain Curse,” based on the novel by Dashiell Hammett, a gripping miniseries for sure, even after two tense airings. Once again, trouble has followed Gabrielle Leggett (Nancy Addison). After a pile of bodies started stacking, including her parents and an assorted menagerie of quirky cult members, Gabrielle seemed to have returned to a normal state of mind and even married Eric Collinson (Martin Cassidy). But, then trouble found her again in a small upstate California town. She’s back to being zonked out and this tiny little hamlet is going to run out of body bags, with her husband being in one of them. 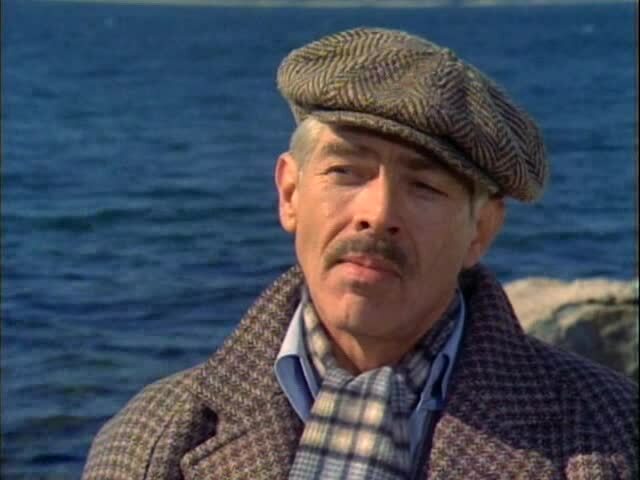 Not to worry, faithful wizened Hamilton Nash (James Coburn), who has taken a liking to Gabrielle, and also stunned everyone by so far figuring out every mysterious strand of her life, has been called to protect her. When Part 2 ended, he was doing just that, having found her in an abandoned warehouse, his effete writer sidekick Owen Fitzstephen (Jason Miller) delighting in the macabre bloody fun. In all fairness, Owen had not had quite so good a ringside seat to the bizarre murders involving Gabrielle Leggett at the onset, back when we found out about her true history, that “Dain Curse” that seems to follow every woman in her family and the for-lots-of-profit religious cult run by Joseph and Aaronia Haldorn ( Ellis Raab and Jean Simmons). That was the fun side of the case. The less kooky part, which manages to bring in more layers of law enforcement than there are people in town, does not have the same flash. No missing diamonds, no psychopaths teaching kids to kill, no strange gasses that knock one out and no crazed cult leaders with shimmering daggers. But, Owen keeps up with Nash, obviously delighted at everything happening as Nash narrates, “‘The Dain Curse’ was far from over.” “Freaks,” mutters Ham, looking out the window to see the swarm of press and curiosity seekers overwhelming the town because of this case. Owen thinks “it’s beneath” Ham to be looking for a madman killer because there seem to be no rational explanations. Owen asks who is the screwiest of all the players in Gabrielle’s life. “Gabrielle herself,” is his reply. Owen is having none of it. “Come away with me while you are still alive,” he offers with oozing self-importance. 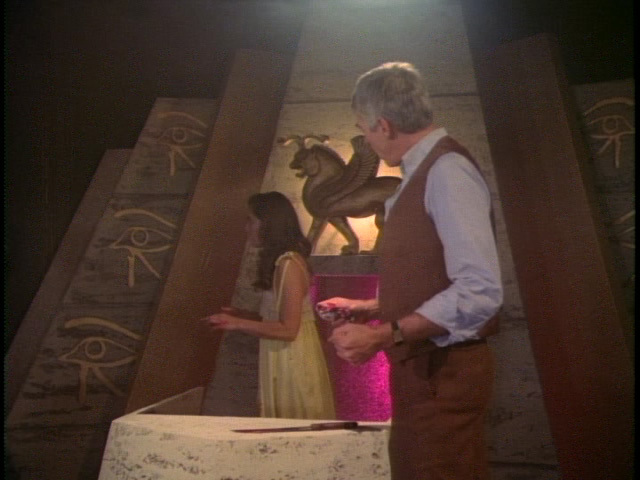 Just then, Tom Fink (Brent Spiner) arrives, the wizard behind the effects at the Haldorn cult. He has a very important piece of news to tell Ham, one that has brought him all the way up to this tiny town. He gets two words into his reveal when an explosion rocks the building. Nash rushes into his room to find Owen on the floor and Gabrielle standing in the next room, shaking and frantic. She even bites him when he tries to settle her down. “I couldn’t believe that Owen, or the half of him that was left, was still alive,” he notes incredulously. It’s the opinion of an explosions expert that a professional built the bomb, but only with some crude materials, this being a small town. The logical suspect is Tom Fink, certainly a creative genius and also one who has disappeared. A momentarily calm Gabrielle is worried about Owen, but also about the curse, hysterical when she sees the bite marks she left on Ham. She cries, “I bring out the worst in men, not even trying.” She is as fully convinced the Dain Curse is very much alive in her. With a slap to his face, Gabrielle shrieks, “I thought you were spying inside my soul.” In order to receive Ham’s protection, Gabrielle is asked to stop using morphine, but she says she can’t. At first. Eventually, she relents and her “sobs cut through me like a knife,” he colorfully narrates. With Nash helping Gabrielle, he’s no longer involved in the details of the case, but is told by his associate Mickey (Malachy McCourt) that Owen is still hanging on and that Tom Fink denies having planted the bomb. 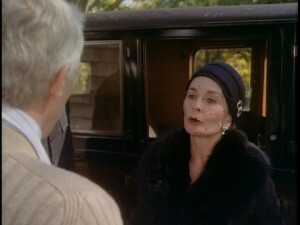 When his pal cracks wise about Nash’s entanglement with Gabrielle, he is told, “I want you to talk to me respectfully around Mrs. Collinson. It’s absolutely necessary that she truly believes I’m the answer to her prayers.” The withdrawal symptoms are making Gabrielle even more hysterical than usual, though begging for a morphine fix. She is scared of it all, but Nash tells her he’ll be by her side the whole time. “She would be screaming for her life in 48 hours. I only hoped to God I could go through with it,” he says in narration, showing a deep interest in Gabrielle that everyone assumes is love. Nash is convinced that Fink did not plant the bomb, but even under police protection in the hotel, he’s still not safe. Ham wants Sheriff Feeney (Hector Elizondo) to lock him up, telling him that he’s convinced Fink did plant the bomb, but in reality, it’s the only way Fink can be safely protected. “I’ve been a Nash follower for years. If I were you, I’d lock Fink up,” reporter Jack Santos (David Canary) warns Feeney when Nash leaves in a huff. The preparations for Gabrielle’s treatment start. She can only go through it with Nash’s help, but he tells her he has to leave for a few days. “Leave? You can’t leave!” she bellows. The reason Nash leaves is to pounce on Hubert Collinson (Roldan Winters), the man who hired him for this leg of the case, the grandfather of Gabrielle’s freshly-dead husband. Hubert is convinced that the murderer has been caught (he was framed) and he pulls Nash off the case. Ham claiming “instinct,” explains that the case has not been solved. “I can get off right now, but I’d rather have a ticket to the end of the line,” he insists…and gets it! Upon his return, Nash finds Gabrielle rather serene, but with a bombshell. “Good news, I’ve decided not to put you though all the trouble of curing me,” she says with a big smile, though he’s smarter and offers her the rest of the morphine she has left, reminding her she’ll “look like an old lady of 25,” and this gets Gabrielle to admit, “I just wanted to hurt you” as she never intended to really dismiss him. “You are to protect her from everything and everybody except me. Now, it’s going be a very ugly three days and I don’t want any interference from either of you,” Nash tells his coworkers the night before the hardest part of Gabrielle’s treatment is to begin. It is every bit as bad as Hamilton warned everyone. She screams and writhes in constant pain, but Ham never leaves her room. It’s an awfully grisly few scenes, harsh and shrill, especially for a miniseries that has kept to a tone of wry amusement the whole time. The American Miniseries was rarely gritty, except when the stars were doing their best to nab Emmy nominations. The original book makes the treatment seem ghastly, and it is, but it also creates a bit of a problem for “The Dain Curse” overall: it’s not a whole lot of fun. Rather than following the curious red herrings and clues to all of the mysteries, it’s a block of time that does nothing but help clean up Gabrielle and show Ham’s unswerving dedication to her. Murder, cultism, barbaric truths, lying and teasing keep a detective story tense and thrilling. Morphine withdrawal lets it go slack. “I had the feeling Gabrielle was getting stronger or I was getting weaker, but I’m not sure how much longer either of us could laugh,” an exhausted Nash admits. Aaronia Haldorn sweeps back into the story. Get this description of her courtesy of Nash: “Her face was a dusky oval between black hat and black coat, but her luminous eyes were real enough.” Now THAT sounds right out of Hammett, much better than any dialogue of the past hour or so. Okay, it’s hard to see “luminous” through a veil, but the rest is perfect. Why is she there? That too is a mystery, but Nash cuts through her compliments to sum it up for her. “You want to know how close I am to finding the answer to the whole riddle of the Dain Curse,” he tells her and she replies that she indeed does “have some curiosity” about it. He tells her indeed he does have the answers. “Then there’s no use in me fencing with you any longer,” she says eerily before pulling a gun from her pocket. He takes it from her and insists she leave. “I’m not interested in that temple racket of yours…go home, Aaronia and behave yourself,” he snorts and with a dangerous glare, she agrees. This is a terrific scene, with a feeling of film noir, great acting and impeccable dialogue. In other words, more mystery, less morphine. And what of Owen, covered in bandages and barely alive in the hospital? He’s able to open one eye where Sheriff Feeney comes to question him about the bombing. “I heard a tinkle of glass,” he is able to murmur, adding “someone threw something in the window.” Jason Miller has been having a great time playing the ridiculous Owen, and now he’s digging deep into the overacting pile for a can’t-fail hospital scene. Ham’s partners and Maria (Karen Ludwig), the woman hired to manage the house for them as Gabrielle recovers, have had it with the treatment. “How about a doctor? A doctor and a priest?” they wail at him. Maria even brings Gabrielle a kitchen knife, hoping her charge will off herself. “Do it for me. Please do it for me!” Gabrielle begs her. She doesn’t, but does sneak in and place it on Ham’s throat while pulling the morphine packets out of his pockets. Having passed through the worst of Nash’s treatment, Gabrielle is lucid enough to ask him, “why did you go through all this for me…please tell me, maybe it’s something I need to hear.” Ham declines with a garrulous and vague tap dance of non-admission. 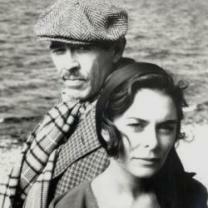 He leaves and she reaches for her breakfast tray, on which Maria has placed the morphine she stole from Ham. From one canny kook to another, Nash leaves Gabrielle to go visit Owen, who tells him the same twinkling glass story he had told the sheriff. Smoking a cigarette in the hospital room, Nash puts holes in Owen’s story. According to Nash, Tom Fink brought the bomb and handed it to Owen when he showed up in the hotel room. In fact, Owen’s involvement in the case goes much further back. “Oh, what a bloody game you’ve played, Owen,” he notes sadly after revealing just how much involvement there was. “Don’t worry about me, Hamilton. I’ll beat the gallows, you’ll see,” Owen starts, then describing his ideas for a court case that will free him. Sane? Insane? Doesn’t matter. Indeed Owen gets the circus trial of his dreams five months later. Nash is testifying for the prosecution and notes how well Gabrielle looks, on hand with her father-in-law. “The jury was the hick town assembly Fitzstephen had expected,” we hear, with Owen colorfully dressed, including a big red mask over his face, except for the small portion not badly burned. The trial itself is breezy, revealing some fun details that take us back to the beginning. Everybody gets one last chance to out-perform each other during the trial. Aaronia, Tom and all the others give testimony for the defense, with one very big surprise revelation shocking everyone. Nash gets his chance to testify that Owen is sane. Owen has been counting in insanity, which will help him avoid jail time. 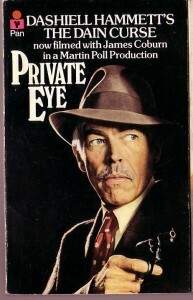 James Coburn has been fantastic and believable in every scene, best of all here. He’s not testifying, he’s speaking directly to Owen for one last round of the mind games they have always played with each other. 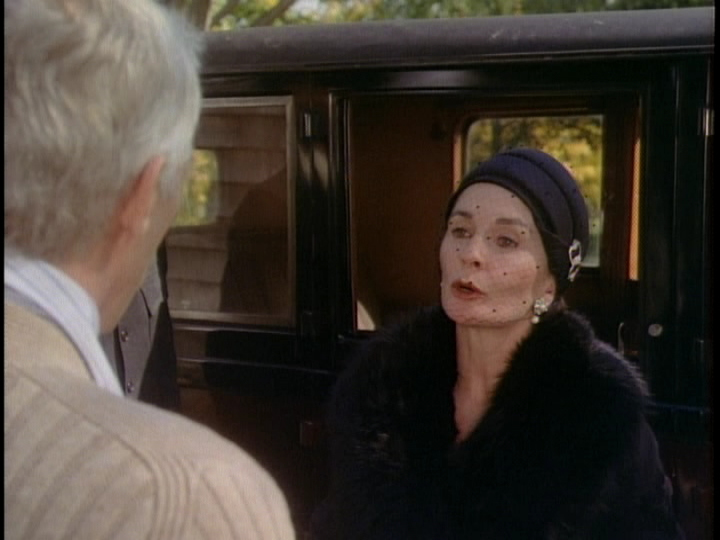 “Your results are astonishing,” a grateful Hubert Collinson tells Hamilton Nash at dinner where a wonderfully recovered Gabrielle still brings a blush to his cheeks. “I could steal hear her voice. Still kind of fresh and lovely. Not for me, of course, but hell a man is entitled to keep a few warm thoughts on a cold night. It was well overdue in the world where I fit: rum runners, thieves, ladies of the night with pistols in their garters, you people who keep guys like me busy. The curse was over. I did my job. I’m just a detective, fair enough?” Nash sums it all up for us before disappearing into the night.